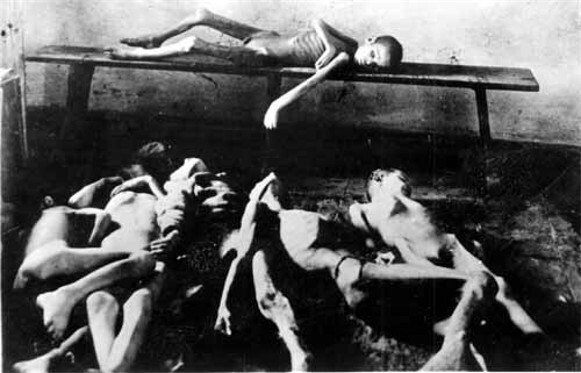 Famine of 1921–3. The famine was set in motion by drought and crop failure. In 1921 only a quarter to a third of the regular prewar harvest was obtained in Soviet Ukraine. The republic’s southern gubernias were hardest hit, with yields down (compared to 1916) by over 75 percent (the figure reaching as high as 82 percent in Donets gubernia and 80 percent in the Katerynoslav gubernia). The calamity was even greater in certain regions of ethnic Russia, mainly along the Volga River. The famine may have been averted in Ukraine, given the fact that food reserves from previous years existed there. Unfortunately, the Soviet government transferred massive amounts of grain from Ukraine to Russia before and during the famine. In 1920 grain was requisitioned with much violence by special military expeditions (see Surplus appropriation system) and Committees of Poor Peasants, and in 1921 an unusually heavy tax in kind was imposed on the peasants of Ukraine. As a result, in the fall of 1921 famine ensued. 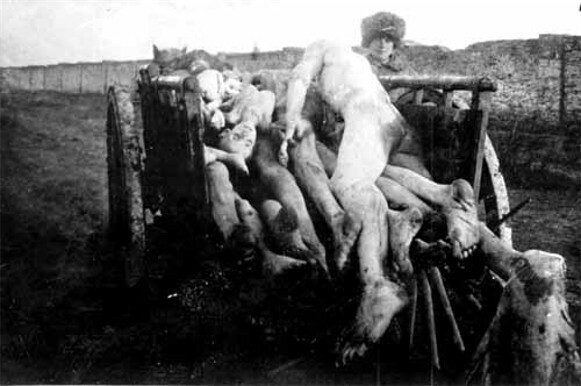 By 1 March 1922, in the southern Ukrainian gubernias that were officially recognized as famine-stricken, 3.5 million people (36 percent of the population) were without food. Gubernial statistics yielded an even starker picture: 78 percent of Zaporizhia gubernia’s population and 50 percent of Mykolaiv gubernia’s were affected. In May 1922 the total number of people affected almost doubled, and the mortality rate rose sharply: in Katerynoslav gubernia, 67 people per 1,000 died in 1921–2, while in the Crimea (then part of the Russian SFSR), 79 per 1,000 died. Epidemic diseases, mainly relapsing fever, typhus, typhoid, and at times cholera, also took many lives. 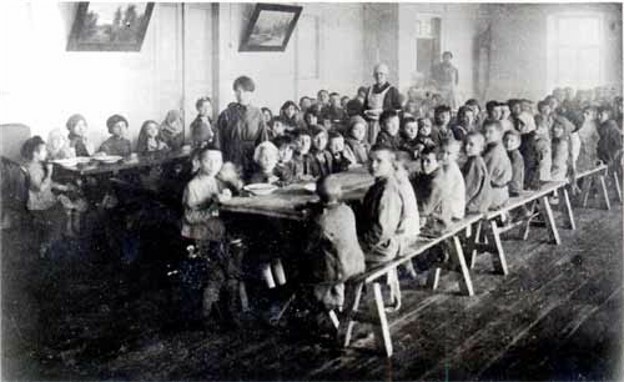 The Soviet government’s famine-relief activities through 1921 were limited to the Volga region of Southern Russia. In fact, Moscow was unwilling to recognize the situation in Ukraine. Soviet Ukrainian officials, who had been instructed that famine relief in Russia was an absolute priority, did not broach the issue of famine in their own republic until late in 1921. In Ukraine most of the relief aid was contributed by civic and co-operative organizations, with the aid of the clergy, who had been deprived of civil rights. Metropolitan Vasyl Lypkivsky of the Ukrainian Autocephalous Orthodox church issued a special appeal for help to the famine victims. Meanwhile the Soviet government confiscated church valuables under the pretext that they were needed to assist the hungry. In Polish-ruled Galicia, a National Committee for Relief to Starving Ukraine was active in Lviv. Similar committees were formed by émigrés in Vienna, Prague, Berlin, and North America. Foreign philanthropic institutions—the American Relief Administration, the Nansen International Office for Refugees, the Jewish Joint Distribution Committee, and the Czechoslovakian Red Cross—became involved in relief efforts. But throughout 1921 their activity was also limited to the Volga region, and only in 1922 were they allowed access to Ukraine. Under Fridtjof Nansen's instructions, Captain Vidkun Quisling visited Ukraine at the beginning of 1922 and later published a report on the famine there. The famine continued beyond the summer of 1922. The harvest that year was again poor (approx 40 percent of the 1916 crop), but better than it was in 1921. The harvest would have sufficed for Ukraine’s own needs if the republic had not been subjected to onerous grain requisitions (see Grain procurement), which were again shipped to Russia. Moreover, the Soviet authorities also exported grain from Ukraine in order to raise hard currency. Once again famine conditions ensued, though not ones as severe as in 1921. The existence of ongoing famine in Ukraine was hidden by the Soviet regime, which claimed that the 1922 harvest had eliminated the crisis. Calculating the number of victims of the Famine of 1921–3 is difficult, because there are no systematic records of mortality during those years or during the preceding Ukrainian-Soviet War, 1917–21. However, the scope of the tragedy is suggested by a count done by medical personnel in the Ukrainian SSR, which established that 235,000 persons died in the winter of 1921–2 in the five hardest-affected southern gubernias. The figure is certainly substantially lower than the actual number, as the survey was by no means exhaustive. Indeed, because the survey was limited to the period when the famine was at its height, it is likely that the number of deaths from 1921 to 1923 was far greater, possibly even a million or more. The question of what motivated the Soviet authorities to aggravate the scale of the famine in Ukraine has not been uncovered in archival sources. Researchers have suggested a number of likely factors. The first and perhaps most benign explanation is that the famine was a by-product of the rushed Soviet effort to establish the rudiments of a centralized planned economy. It is also possible that the authorities were keen to prevent unrest in industrial centers, where large concentrations of hungry and discontented workers would have represented a real threat to Soviet rule, and therefore grain and food were redirected there from the countryside, whose peasant inhabitants were much more atomized and thus less of a concern. The Bolsheviks might also have wanted to consolidate their main base of support in Russia and did so by supplying it with grain and food at Ukraine’s expense. Finally, it has been posited that in order to quell Ukrainian opposition to Bolshevik rule (see Partisan movement in Ukraine 1918–22), the Soviet regime was prepared to and did use famine as a weapon.